This salad has everything! 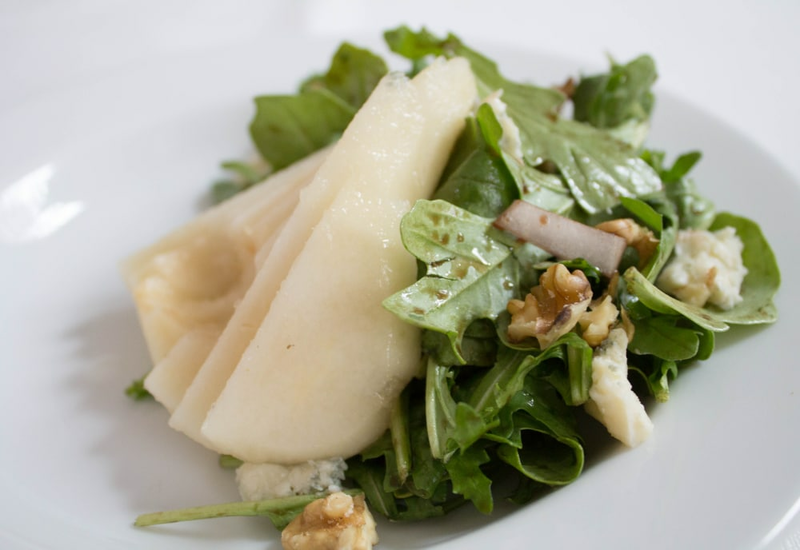 Sweet and juicy pears, toasted walnuts, and tangy goat cheese top a bed of lightly dressed greens for a quick and easy salad that's a satisfying side dish, or delicious all on its own. Mesclun lettuce and red onions are tossed with a simple mix of balsamic vinegar and olive oil for a tasty base. Serve this salad as a tasty accompaniment to roast chicken, pork tenderloin, or grilled salmon. Your guests will never guess that it takes only 15 minutes to put together! To serve a crowd, simply double or triple the ingredients. Look for pears that are firm, but have a little bit of give when squeezed. Blue cheese also works well in this recipe. Try it in place of the goat cheese. You could also swap the pears for sliced apples for a crunchier texture, and try pecans in place of the walnuts. Per Serving: 258 calories; 18g fat; 18.9g carbohydrates; 8g protein; 13mg cholesterol; 147mg sodium. this is such a classic recipe, it's always my go-to order at restaurants. now i can make it at home! i've made it twice, and once i used candied walnuts and loved it. I'm not really a salad person, but I hosted a small gathering at my house for a friend and decided to make a large batch of this recipe for the guests. Everyone loved it! People kept asking if it was ordered from a restaurant, and when I told them I made it they were really impressed. I have to also admit, it was really delicious! The pear, vinegar, and goat cheese worked so well together. i made this to go with an oven roasted pork loin. We also used Bosc pears. It turned out really, really good. Perfect appetizer salad for dinner. I made it to go with my cast iron pan roasted chicken (recipe also on this site). Great tasting salad, especially with the walnuts. Made a couple adjustments here. Used blue cheese and sliced apples. Loved the crunchy texture and flavor.